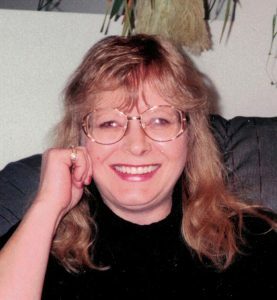 After a lengthy illness, Dawna Nicholson of Kamloops, BC passed away peacefully with the love of her family by her side on January 7, 2018. She was 71 years of age. Dawna was born in Edmonton, AB on February 27, 1946 to Pauline Teskey. She was adopted by Martha Belter and Ed Liddle when she was 2 years old. Dawna moved to Kamloops in 1976 with her children and made it her lifelong home. Dawna worked in the service industry for a short time but her real career was as a loving mother of 3 children and caregiver to many foster children and many others. She was a volunteer with the Royal Inland Thrift Store and loved to shop for vintage trinkets. Bingo was her favorite game and collecting salt n pepper shakers as a hobby. Dawna is survived by her loving partner, Grant McKay, her children, Jimmie Nicholson (Lydia), Paddy Nicholson & Billy Kostenuk (Jennifer), all of Kamloops. Her brother Norman Liddle of Vegreville, Alberta, 6 grandchildren, 2 great grandchildren, 5 step grandchildren and her nephew Kelly Liddle (Terry) of Storthokes, Saskatchewan. Dawna is predeceased by her birth mother, Pauline Teskey, her adopted mother, Martha Belter, her father Ed Liddle and her sister-in-law Dee Liddle. The family sends heartfelt thanks to all the care-aids, nurses and doctors whom took great care of mum over the years. Bless you all. Dawna chose to not have a service, but for all who knew her, to remember her smile, her fire cracker personality and her strength. Rest in Peace Mumma. However, take comfort in knowing that he is now at rest but only temporarily. My deepest condolences go out to the whole family.